Photographer Austin Mann on Wednesday posted an in-depth look at the camera hardware and software suite offered with Apple's iPhone 6 and 6 Plus, taking the handsets to Iceland in a shootout against last year's iPhone 5s. While a number of reviews have noted improvements with the iPhone 6 and iPhone 6 Plus cameras, none have taken the handsets into the field for extensive real-world testing. 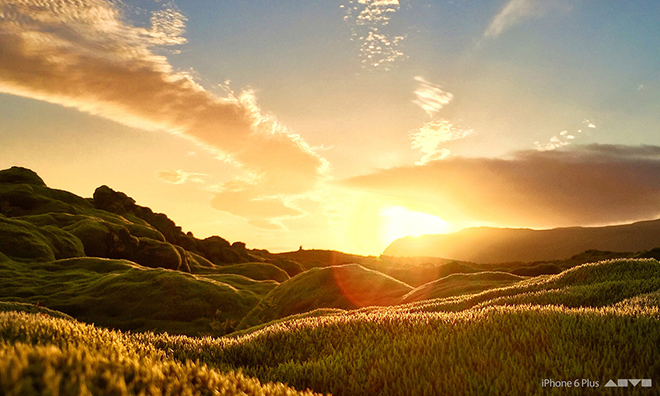 Mann, in partnership with The Verge, did just that by trekking through the rugged landscapes of Iceland to offer a unique perspective on Apple's new iSight enhancements. More of a showcase than a review, Mann's post does well to capture the promise of Apple's iPhone 6 and 6 Plus hardware when put in the hands of a professional. Mann brought along both new handsets, as well as a reference iPhone 5s, and many of the shots were taken using a special dual-iPhone rig that allowed for side-by-side comparisons. Overall, the new iPhone 6 hardware is a major improvement over the outgoing model in light capturing ability, resolution and color accuracy. The photographer made special note of phase detection autofocus, which Apple has branded "Focus Pixels," saying the technology will allow iPhone 6 owners to shoot in totally different ways. Aside from super fast constant focusing for still photos and video, users have expanded capabilities in shooting dark scenes. In a video comparison highlighting the difference in autofocus speed between the iPhone 6 and iPhone 5s, Mann set both to focus on a rock before throwing it into the sea. Before the rock splashed down, the iPhone 6 had already refocused on the water. By comparison, the iPhone 5s never refocused. On software, Mann says the features included with iOS 8 allow for greater manual control over image taking, pointing out that the new on-screen exposure control feature can help frame dramatic shots. Also tested are the new iPhones' 240fps Slo-Mo mode, time lapse mode, panoramic imaging and optical image stabilization.